A PART OF THE BIG PICTURE. FOR THE GOOD OF SOCIETY. Conducting business sustainably means to act for the good of society. Our success as a business should help the people around us to develop and grow. What we give back to society. Approximately 2,300 people are employed by Brau Union ­Österreich – spread over many regions of our country. We give our employees work and sustenance in addition to many options to further develop professionally. This translates to 2,300 jobs and around 21 million euros of income tax which flows into the ­national budget. An additional 99.8 million euros of beer tax also went to the government in 2016. Supporting social work is also important to us: We donated around 16,500 euros to charity organizations such as “pro mente” in 2016. Through our brands, we have sponsored activities and events in diverse areas – as a sponsor for UEFA Champions League, as a partner of the Austria Ski Teams or as a supporter of ­Austrian ­soccer (football) teams. As a sponsor, we also have a hand in ­various music events, providing active support for organizers. ­Moreover, we promote local traditions and culture through our activities and partnerships in all areas of the country. As a producer of alcoholic beverages, one thing is clear: It is our duty to promote the responsible behavior with regard to alcohol – including the protection of minors and communicating the ­dangers of drinking and driving. We fully comply not only with strict legal requirements but also with the self-imposed rules outlined in “HEINEKEN Rules on Responsible Commercial Communication. (see http://www.theheinekencompany.com/about-us/business-conduct). How we strengthen Austrian beer culture. Our goal is to shape and develop Austrian beer culture according to social and environmental challenges. 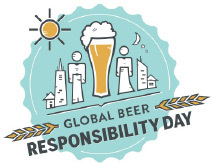 First and foremost, this entails consciously conveying the responsible consumption and enjoyment of beer to our customers. We do not tolerate any kind of alcohol abuse, so our activities revolve around education, information and prevention. Our advertising and marketing campaigns are never directed towards teenagers or children. We want to convince all of our consumers that quantity does not play a role when drinking beer, but rather it is the quality that enhances enjoyment – whether you are a young adult attending a rock festival or an established member of the community at your local pub. We are constantly communicating the importance of responsible alcohol consumption – a message that can be seen on Gösser banners displayed at winter sports events or the Puntigamer banners at soccer (football) games. The Gösser brand, as a partner of ÖSV, was also present at ski competitions held in 2016/17 with CSR bands bearing the slogan “Vernünftig genießen” (enjoy responsibly). Our Zipfer, Gösser and Puntigamer brands list the respective websites on their labels to share tips on the responsible consumption of alcohol. We are offering our consumers a growing product palette, which promotes the responsible consumption of alcohol. Once again in 2016, our focus returned to the development of reduced-­alcohol and non-alcoholic beers. The results are quite clear: Today, Brau Union Österreich has eight reduced-alcohol and eight non-­alcoholic beers in its portfolio. The non-alcoholic Gösser Kracherl Holunder and the Puntigamer Frei Radler were among the top ­innovations in 2016. Safe and healthy products of the best Austrian quality – this is what we offer consumers. The quality of our products is ­continuously tested and evaluated in our laboratories. HACCP systems are in place to identify any potential risks. All of our products are free of genetic manipulation. Six of our facilities are certified to conduct testing according to the International Food ­Standard (IFS), an international food safety standard. Gösser beer is brewed with raw materials exclusively from ­Austria, which is why it bears the red-white-red AMA quality seal. The Schladming Brewery offers outstanding organic beers which have been awarded the BIO Austria seal of approval. The residues from production, known as spent grains, are utilized as animal feed and as an energy substrate in the production of biogas. In order to guarantee the safety of this by-product, the spent grains are labeled with the PASTUS+ certificate from Agrarmarkt Austria Gesmbh. This also applies to spent yeast that is utilized as animal feed. We value transparency: Consumers should be informed about the ingredients in their beer and their nutritional value. To this end, in late 2015, together with other brewery members of the “Brewers of Europe” organization, we agreed to ­voluntarily provide this type of information on our products. We learn from our partners in business and in research by ­taking the opportunity to exchange information with customers and consumers. We maintain clear communication channels with our suppliers, business operators, political representatives, ­media partners and other key opinion leaders. Of course, positive feedback and even constructive criticism are always welcome – we rely on both to continuously improve our products and our work processes. We attend industry events, podium discussions and professional trade presentations to seek information on current innovations and gather feedback. In 2016, we were represented at the Regal Branchentreff, Cash Handelsforum and REWE ­Sustainability Week. Collaborating with Austrian universities and polytechnic institutes is important to us. We readily mentor relevant ­scientific research projects. This keeps us on the cutting edge of technology and helps drive targeted innovations. New ideas are often implemented together with other companies; for example, we worked closely with the company BDI – BioEnergy ­International in Göss to ensure that our spent grain fermentation system was running smoothly. In Zipf, we are working with the company RAG, Rohöl Aufsuchungs-GmbH, to utilize ­geothermal energy in the brewing process. “Jugend am Werk” develops prospects for a better life through integration of people with disabilities. In 2016, “Jugend am Werk Steiermark” and the project “Re-Use-Design” entered into a cooperation with Brau Union Österreich: People with disabilities manufacture key chains with bottle caps from our different product brands and fabric remnants from a regional company that makes traditional Austrian folk clothing. The key chains are given to customers as gifts. Through this project, nearly a dozen people with disabilities have meaningful employment. Cooperation with “alpha nova” in Graz. The ­organization alpha nova in Graz supports people with disabilities through vocational integration. The ­Puntigamer Brewery hires people with disabilities as part of a collaboration project with alpha nova. Cooperation with the social welfare organization Diakoniewerk Schladming. The Diakoniewerk Schladming offers people with mental and multiple disabilities employment opportunities tailored to their specific needs. As a project partner, the Schladminger Brewery provides meaningful employment to disabled people, allowing them to participate in working life and enjoy the benefits of a structured day. Cooperation with “assista Soziale Dienste” Vöckla­bruck. The organization assista provides opportunities for integration of people with disabilities. In 2016, assista launched a collaboration project with the Zipfer Brewery. This project made it possible for four individuals who ­previously had difficulty finding gainful employment on the job market to find a suitable position. Cooperation with “Arge Chance” in Schwechat. The organization Arge Chance is a socio-economic ­enterprise supported by the AMS and the state of Lower Austria. It offers jobs to the unemployed, vocational training as well as short-term social care. The Schwechater Brewery has collaborated with Arge Chance to offer ­individuals with disabilities gainful employment. In 2017, we plan on strongly emphasizing the responsible consumption of alcohol in society. This is intended to drive our cooperation with various stakeholders so that we remain at the forefront of sustainability in the brewing industry. New innovations in this area are also scheduled for launch in 2017.